2011 was the inaugural season for StormGroup Chasers - many thanks to those first 16 people who took a leap of faith and decided to launch this journey with us. In 2018, the 18 people pictured to the right shared this unique journey together. 40 testimonials, outlining their reactions to their first tours with SGC, are listed on this page - these reflect this unique experience through their eyes - the people who share this fantastic road trip are what make it so special. Hope that you enjoy reading through these varied perspectives, and that they encourage you to join this storm chasing fraternity. My name is Susie and I'm from the great state of Texas. I have toured with SGC the past two years. In 2017 we deemed it the "blue sky tour" since we saw little rain and no storms, with exception of the very first night, when there were tornadoes all around us, but...it was dark!! We still had a wonderful time going to the beach, Battleship Texas, NASA, a Civil War Battleground and other interesting sites. Peter has spent so much time in the states, that he knows things to do when the weather isn't cooperating. Pretty good for a British, Canadian, Kiwi. 2018's tour was vastly different than 2017's. We CHASED STORMS!!! We were much further north most of the time. We visited six states and saw "weather", AMAZING weather nearly every day. We would usually start with breakfast at a local eatery, which Peter had heard good things about, then it was off to Walmart to fetch groceries for lunch. After that, Peter would determine the best "target" area of the day. Since storms typically don't fire up until late afternoon, we had plenty of time to visit interesting places. We checked out the largest train yard in Nebraska, the Wizard of Oz museum in Kansas, and the Barbed Wire Museum, also in Kansas. My personal favorite was Colorado!!! The room we stayed in had a stream of "snow melt" rushing behind it. We saw kayakers and sat at the picnic tables and had a night cap at the end of a long day. The next morning we went to the top of Mount Evans. Temp was 44 with a wind chill of 35, my kind of weather! Snow was still on the ground, we were able to see Pike's Peak nearly 100 miles to the south, mountain goats, beautiful scenery everywhere. It was breathtaking. My whole point with the things, other than weather, is that there is ALWAYS something to see or do while waiting for the storms to pop...and pop, they do!! In 2018, every single day, but one, we saw thrilling storms. Barely any tornadoes to be seen this year, but it was totally worth it. 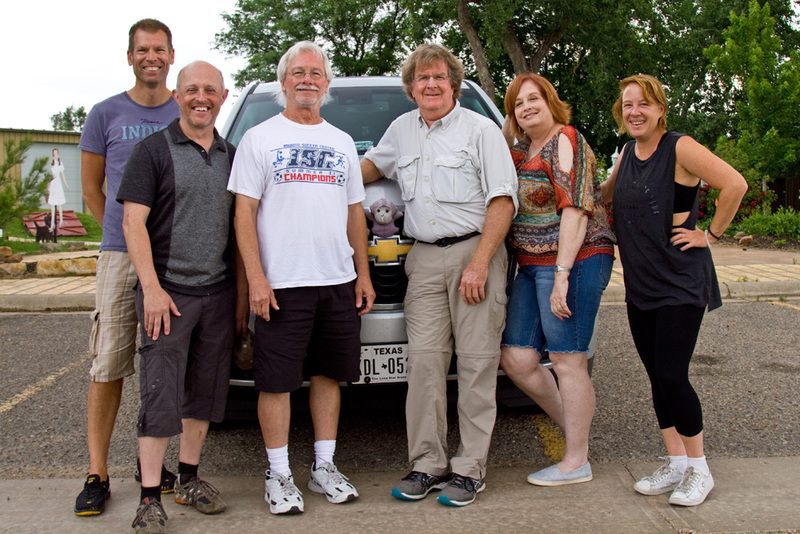 Our travelers were from Canada, The Netherlands, Australia, Texas and of course New Zealand. An eclectic and FUN bunch to travel with. I see no reason, if Mother Nature cooperates, that 2019 should be any different. To Peter and all the SGC go forth and conquer. You will experience things you've only dreamed of and take the pictures of a lifetime. 2018 - Attending this tour (Tour 4: 10th-16th June 2018) has fed my passion for severe weather and a spot of sightseeing; the two qualities of this tour. Despite 2018 being regarded as an unusually quiet season, we managed to witness severe weather events almost every day across 7 states including intercepting 2 intense storms almost producing a Tornado! The tour enabled me to see parts of the US I wouldn't normally see, especially to the extent that we did (~ one state per day). One personal highlight for me was driving through tornado scarred areas associated with El Reno, OK and Greensburg, KS. The tour itself is well organized and accommodating to the group's needs whether it be rest stops (bathroom breaks, refuelling and snack supplies) or briefing on the day's outlook and development as they progressed. The chase vehicle is very spacious and comfortable which certainly helped with longer trips. Group members were super friendly and tour guide Peter was very helpful in explaining the science of these storms prior to and during chases and informing us of plans throughout the day. 2018 - In my part of the world, we use the word “lagniappe” to describe that little something extra life occasionally hands to us. Whether it’s a small piece of good fortune or even the extra cookie slipped into the baker’s box, lagniappe prompts the simple joy of receiving something unexpected. My expectations for the Stormgroup Chasers tour were high; I’d been conditioned by my husband’s previous experiences with Peter Wharton and a gang of folks from all over the world whom my husband now calls friends. My husband had waxed poetic about his own storm chases, citing Peter’s expertise, Peter’s conservative views regarding safety and storm chasing without sacrificing quality of experience, and the sheer delight not only in catching the occasional funnel, but in watching storm development from cradle to grave. What I hadn’t anticipated were the bonuses of the tour. Yes, I felt safe, my curiosity was piqued, and I saw beautiful cloud formations and countryside views. What I hadn’t expected was the sense of being included as a valuable team member, despite my amateur status. I hadn’t expected the unique pleasure of traveling with like-minded folks who appreciate the dynamism of nature and its beauty. I hadn’t expected to laugh as much as we did, despite our group coming from several different countries and from a variety of cultures. I was humbled and felt the universality of a sense of wonderment as our team viewed slices of America. Together. 2018 - I recently had the chance to scratch one off the bucket list: storm chasing. After my week on the plains, however, I came to the realization that storm chasing trips are much like the gas station potato chips I ate along the way: one is simply not enough. Thus I begin studying the options for next year. Chasing storms is the Great American Road Trip. It gets you off the Interstate and on the highways and byways of the USA. You see things that you would otherwise have no opportunity to see and visit small towns in the heartland where it seems that time passes more slowly. You are likely to see amazing supercell thunderstorms, golf-ball sized hail (hopefully only on the road), more lightning than you can imagine and, if you are very lucky, the holy grail of storm chasing: a TORNADO. If you do decide to go, then you cannot go wrong with Peter Wharton and StormGroup Chasers. From a logistics standpoint, the vehicle is a Suburban which is much preferable to the cargo vans used by most companies; the group is small and mobile, and the prices are the most reasonable on the plains. Peter is extremely knowledgeable about weather and the models, forecasting, etc. and able and willing to share this knowledge. It is always rewarding to spend time with people who are passionate about what they are doing, and that describes Peter. He is also a fascinating person, with tales to tell about his trips to Mount Everest, Antarctica, and others. 2018 - My wife and I had a great time with Peter and others storm chasing. There is nothing quite like the adrenaline rush when the chase is on. The adventure is about much more than spotting a tornado. It is the anticipation every morning, waiting for the storms to develop, driving to the most promising locations and then, going like crazy when the severe weather begins to break out. It is the beauty of nature, the breathtaking scenery, the foreboding beauty of a super-cell formation and the lightening flashing across the evening sky. 2017 - Storm chasing might be a misnomer sometimes ... in actuality, storm chasing can more accurately be described as road-trip roulette aided by meteorology. There is no defined destination, no idea where you will wake up, what you will see, who you will meet and what you will experience out there. You might be in the middle of a Kansas cornfield one day and the heart of Cajun country the next. There is a constant sense of adventure and a giddiness to waking up in the morning having no earthly idea where you might end up next. Some of what ends up happening is determined by the delicate, baffling mix of land, water, air and temperature that can only be confidently predicted in the broadest of terms. A good guide uses science, experience and hunches to point the group in the right direction, to the next location. The rest is determined by chance, serendipity and the energy of those who are along for the ride. 2016 - I was fortunate to have been subbed into Tour Five this year at late notice, and I couldn't have hoped for a better experience for my first storm chasing tour! Peter was the consummate storm chasing tour guide, full of both knowledge and wisdom, and quick to dispense both. He has a keen eye for developing storms and a passionate interest in the field. During inevitable down times during our weeklong tour (i.e. several mornings), he has a considerate concern for his guests' interest levels and planned entertaining diversions for us, whilst always maintaining an eye on the forecast timing to ensure we were still "positioned" properly when it came time for active chasing. Peter also possesses a scholarly wit, and can regale his tour group with both weather facts on-the-move as well as personal tales of adventure that border on Indiana Jones-ish. Accommodations were secured every night at motels that were safe and clean, thanks to advance planning, we never stayed anywhere inadequate. Our food choices were a mix of interesting local finds (fantastic Creole food in Montana... who knew?) and grab-and-go when there was a need to well, grab and go! 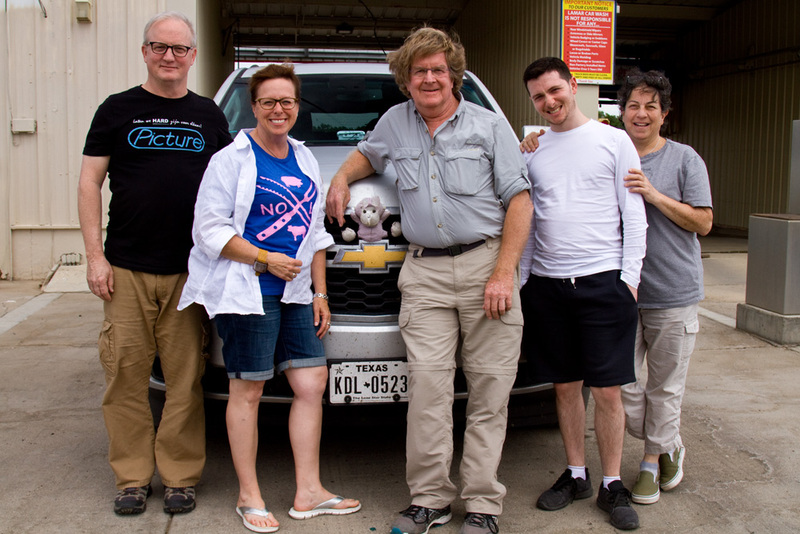 Because Peter's tours are limited to 6 people -- including himself and his co-driver -- it remains a compact, flexible, intimate, fast-moving group dynamic. With all due respect to the large caravan-style tours on the market, I much prefer this self-contained tour method. The other major difference of course is that Peter does not run this operation as a for-profit tour company. It's more like "splitting the costs" of storm chasing, which means that he's doing this to pursue a passion instead of dollars. In addition to Peter's knack for storm-finding and tour planning, I found Rick to be a courteous and competent co-driver, also knowledgeable and well-equipped to help gauge the skies. 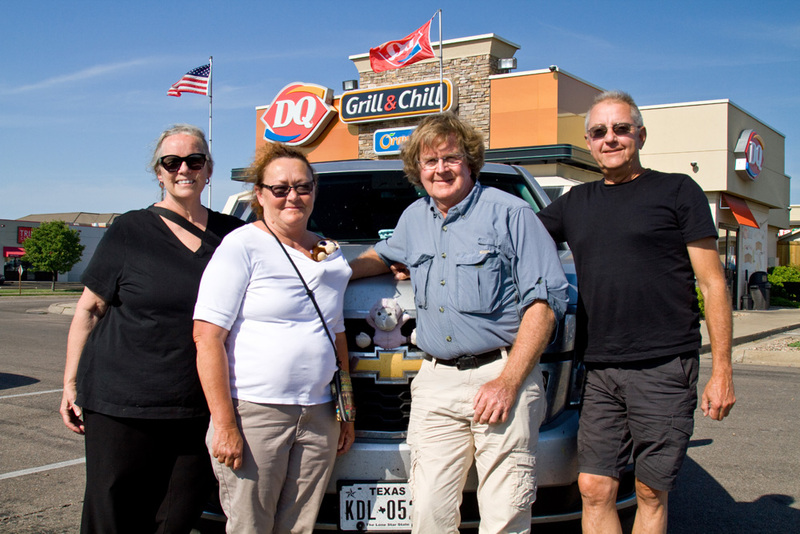 Brad, Jody and Lena were delightful companions making for a congenial backseat experience, even over a 4,000-mile road trip week. 2015 - My husband and I chased with Storm Group Chasers for the first time in May 2015. We chose them because of all the positive reviews we found online. We had previously chased with another tour group and were eager to experience this one. One of the things that attracted us to SGC is the fact that they use only one vehicle – a large SUV – as opposed to 3 or 4 vans that other groups use. The SUV we were in was roomy and comfy, and it was a pleasure to have a cooler onboard so that we could store drinks and munchies for snacks and picnic lunches. Another benefit to having a single vehicle with 6 passengers was that we had more options for breaks and lodging – no scrambling to find places that could accommodate large groups quickly. We ate and stayed mostly at smaller, “Mom and Pop” – type diners and motels. Another thing we liked about touring with SGC was that, owning to the small group size, we were able to do some mighty fine sightseeing at a leisurely pace, such as the Buddy Holly museum and the Mineral Wells Hotel; the latter is on the National Register of Historic Places. The bottom line for many chasers is, did you see any tornadoes? The answer is yes, we did: a nice stovepipe/elephant trunk from a safe distance. I would be remiss if I didn’t give props to Peter Wharton himself. He is a professional and a gentleman, truly caring and hospitable, knowledgeable, and a delightful traveling companion. Thanks for all you did to make ours a memorable chase tour, Peter! 2015 - What an amazing tour! Thank you so much, Peter, for one of the most amazing experiences of my life! I could not have picked a better tour! SGC's tours are personal, informative, and packed full of adventure; I call it the best road trip ever! Days are full of whatever the local sights are (and there are lots - museums, parks, hiking and picnics, and Peter always knows what to see) and then late afternoon for the storms. His ability to get us to the right place at the right time was spot on (personally, I think he is a wizard). Whether stopping to shoot buffalo or pronghorn, deserted farmhouses or rock formations, or the most amazing storms I've ever seen, we were all of one mind. The small group made travelling a joy, and I made lifelong friends that love nature and photography the same way I do. 2015 - My boyfriend (can you still say that if you're over fifty?) is very into storm chasing, and he invited me to join him this year, for a week. I enjoyed it very much, saw lots of beautiful scenery, impressive skies, spectacular lightning shows, hail the size of golf balls, and even a tornado! The tour was organized very well, and though my friends at home were a little concerned I would make it home in one piece, I felt very safe during the tour, thanks to two great drivers! I will certainly recommend StormGroup Chasers to people who are interested to experience a storm chase. 2015 - All I can say is Wow! What an awesome experience and team, with both the great expertise of Peter (one of the best in the industry) and skilled assistant/driver, Brad. It was one of the most exciting experiences in my life, and what great storms and pictures to show all. In fact I have already let Peter know that I will be back in 2016 for some more StormGroup Chasers. 2014 - This was my first year chasing and I am hooked. Despite being late in the season, every afternoon delivered another jaw-dropping encounter with a gigantic, beautiful, swirling storm. I saw the most intense lightning display I've ever seen, and was introduced to many types of weather I'd never imagined. Our leader, Peter Wharton, gets full credit for getting us into the right places at the right times. He demonstrated a great mixture of knowledge, planning, instinct and caution that kept us excited, but never scared. I am a landscape photographer, and came away from the trip with images that have inspired more positive reaction than almost any other work I've made. 2014 - I've always had a great experience when chasing with StormGroup Chasers. Peter is an experienced storm spotter and leader getting us on great storms while keeping safety a priority. Having a love for photography, most photo opportunities are accommodated as long as it doesn't interfere with the timing of the chase. For anyone who is interested in the technical aspects of targeting severe weather, Peter is eager to share his knowledge. 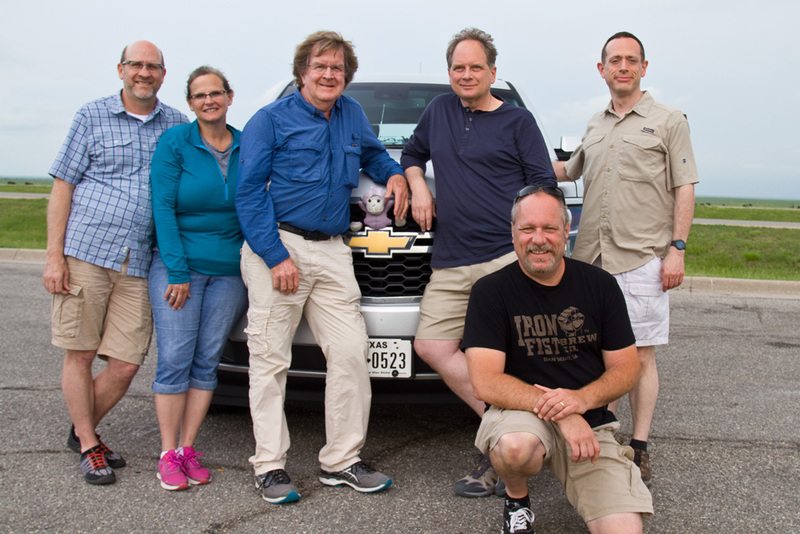 2014 - My StormGroup Chasers tour was fantastic. From start to finish, it was a fun, engaging experience. We were on all storms of any significance. SGC would always position well for any potential storm outbreak and take the necessary actions to get us there in time, safely and without incident. You feel with SGC that if there was a storm to be seen, we’d be there. 2014 - The two main reasons why we think this group suits us is there is only 6 people at once. The other reason is our Tour Leader, Peter Wharton. He always manages wherever possible to get us in the right place at the right time, but without taking undue risks. Peter is very friendly and approachable and has a vast knowledge and a sixth sense for the weather, probably due to instinct and experience. 2013 - Without a doubt, this was the best adventure vacation I’ve ever had! It was both an educational and exciting experience! The team lead, Peter, is very clever and willing to share his wealth of knowledge in an easy to understand, interesting manner. Anything you want to know about weather phenomena, he is happy to inform. Importantly, safety is always at the heart of any decision made and because of his understanding of storm dynamics (and perhaps some good old fashioned intuition) Peter always placed us at the “right place, at the right time”. What better way to see places in the US that you may not otherwise visit?! The photographic opportunities were boundless and the laughs and the friendships made with like-minded persons will last a lifetime. The smaller, nimble group approach allows you learn and see much while greatly simplifying travel logistics. 2013 - A fantastic job of finding tornadoes, sand storms, hail, lightning etc etc – was really spoiled and it would be tough to repeat or better it. The weather interpretation and positioning were truly outstanding and despite the severity of the weather systems, I felt in really safe hands. We were also unbelievably well looked after. The eclectic choice of unique breakfast venues, the picnic lunches and the effort to provide variety in our evening meals was indicative of how much the focus was on us and providing a truly holistic experience - customer service par excellence! All in all a great experience - thank you. 2013 - Excellent trip and overall experience. The combination of being part of a like-minded group, with great leadership, education and driving from Peter and Brad; being in the right places for the best storms; the sheer beauty and power of the storm and cloud systems; and the hospitality of rural America plus the scenery stops along the way all makes for a compelling week. Most of all the confidence in knowing that we were in the right-place at the right-time, spot on each day, meant we had made the best of opportunities for observation without unnecessary risk. Thanks again for a great week. 2012 - I went with StormGroup Chasers in 2012 as they were offering a different experience to the other tour operators I'd been with before and will be coming back for more with them. I also saved in the region of $1000 on the trip which is a bonus. So what's different? You get a great storm chasing experience but combined with a well thought out and engaging road trip. Bearing in mind the 3000 or so miles travelled in a week there's so much more to the Plains than just storms (don't worry you will see some) and cliched tourist stops: great scenery, photo opportunities, quality food stops and picnics, meeting the interesting and friendly folk of the Mid-West - in short some authentic Americana.